The sky is the limit when it comes to plumbing fixtures !! The sky is the limit when it comes to plumbing fixtures today, both financially and in design. The bathroom of the 21st century does not have to be the bathroom our parents grew up with. You can have a nice, clean, basic bathroom. Or you can have a gold plated Italian bathtub, with a basin carved out of a piece of marble. Either way, JW Brian Mechanical would be pleased to install them for you. 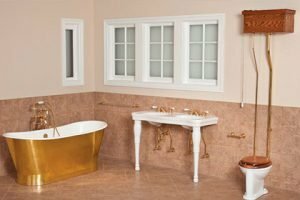 Also, although most would prefer to select their own plumbing fixture for their home or business, we are experienced and able to help during the research and selection process. Just let us know and we will help you during your hunt for the perfect fixture! If you have a question or need a quote for your next plumbing fixture installation in Edmonton, please contact us!